Disregard the last post: I’ve heard directly from Valve that only thirteen of their staff work on Steam. If you’re thinking about the Steam team, that’s the list to think of — plus whatever else I’ve forgotten. There’s a bunch of guys who are kind of on the steam team who do game releases. They include five people total, probably, who get the games, test them, get them into Steam and distributable on the content servers, and then write the news updates and do the artwork for the storefront. This all comes by way of group chat messages with Valve’s Burton Johnsey (formerly known as tonjohn, SPUF old-timers). [The particular quote above was originally by Mike Blaszczak, however] Burton can only think that other Tom got the numbers wrong — but as the currently 25-strong Steam group proves those numbers can and do fluctuate. 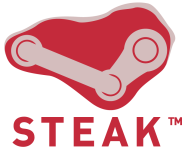 Some other titbits gleaned this evening: the number of staff at Valve is now around 200, and every one of them outside Steam is currently working on Left 4 Dead, and will move on to “more DLC for TF2, DLC for L4D, and EP3 among other things” once it ships.